Peel and slice the banana into pieces about 1.5cm long, and arrange them on top of the puff pastry, spaced slightly apart. 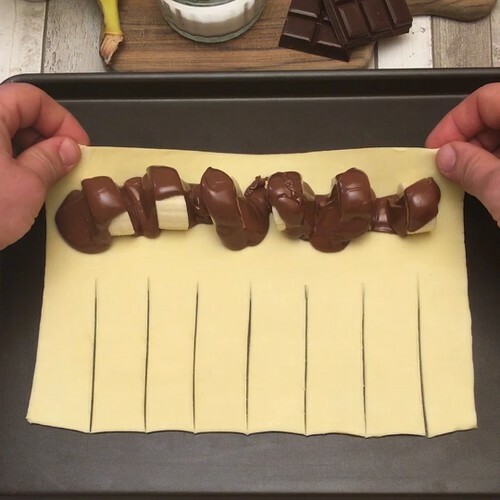 Pour Nutella onto the banana slices. Cut strips lengthways (about 2cm wide) on the remaining pastry, then roll up the dough on itself. Join the 2 ends of the dough together to form a crown. Brush the pastry with the egg yolk. Place a ramekin in the center of the crown, and fill it with squares of milk chocolate. Bake the crown for 30 minutes at 180°C. Enjoy by dipping pieces of crown into the melted chocolate.